Hunt J. E. T. B.
MARYLAND STATE BUSINESS DIRECTORY. 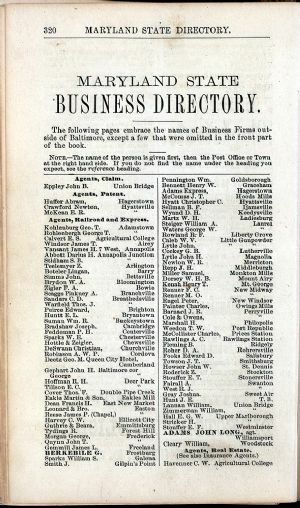 The following pages embrace the names of Business Firms out- side of Baltimore, except a few that were omitted in the front part of the book. NOTE.—The name of the person is given first, then the Post Office or Town at the right hand side. If you do not find the name under the heading you expect, see the reference heading.